and everything cool that goes alongside it. More details ahead! These words may appear a tad too techy, so let me explain. Behind the ad blocking process of every AdGuard app on every platform essentially lies the same algorithm. This algorithm — network stack — has been significantly improved recently. In this version, we integrate the Android app with it and also with our new filtering library, and this allows for the performance rate to rise unbelievable 3 times compared to the old numbers. Yay! Wouldn’t it be great if you could use AdGuard together with TOR? Well, you can! There is now a separate screen for outbound proxy configuring inside the Settings tab. You can now add, configure and use multiple proxies through AdGuard, but setting up TOR proxy via Orbot is especially easy. Once you install Orbot, there will be a configured TOR proxy at the ready in the AdGuard proxy settings. Just enable Orbot in the notification bar, tap on the Configure Tor integration button to save the configuration, and you are good to go! Of course, you can set up other proxies too. Manuals for some of the most popular proxy providers can be found in our Knwoledge base. Please note that only filtered apps’ traffic is routed through AdGuard (which means it will only work for browsers in the free version). Also, UDP traffic is not routed through proxies due to the limitations of proxy servers protocols. AdGuard used to provide low-level settings for those who want to delve into customizing their DNS parameters. Needless to say, this approach was unintuitive, unconvenient, and the majority of users didn’t even know about these options. We have not only vastly expanded the possibilities in terms of working with DNS settings, but even allocated a separate screen for it. 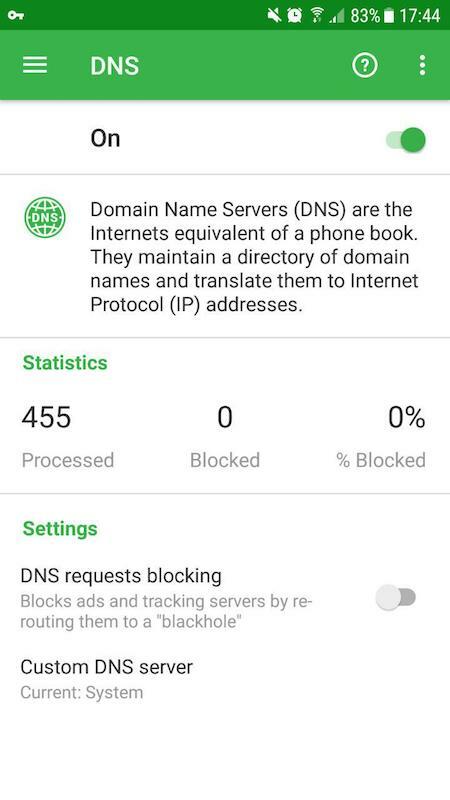 You can find the DNS tab in the side menu. So, what do you see once you get there? First and foremost, the master switch that shuts down anything DNS-related. A separate switch for the DNS filtering, a statistics block and a button to choose your current DNS server to use. Now, this is where the most interesting things are happening. You can also use custom DNS settings by entering DNS server addresses manually. If you have a sharp eye, you have probably noticed the DNSCrypt tab at the top of the screen already. This is another great feature. DNSCrypt is a special protocol that makes your DNS traffic secure by encrypting your communication with the DNS server, thus preventing tampering and tracking by any third party including your ISP. We strongly recommend choosing a DNS provider that supports DNSCrypt, and the list we offer to choose from just goes on and on and on. Historically, questions about AdGuard battery usage are among the most frequently asked ones. Sadly, Android distorts the battery consumption breakdown, attributing other apps’ traffic and battery consumption to AdGuard. We’ve even written a detailed Knowledge base article that explains this issue. To mitigate the misconception, we added a new screen called ’Battery usage’. You can access it by tapping on the battery icon in the top right corner of the main screen. 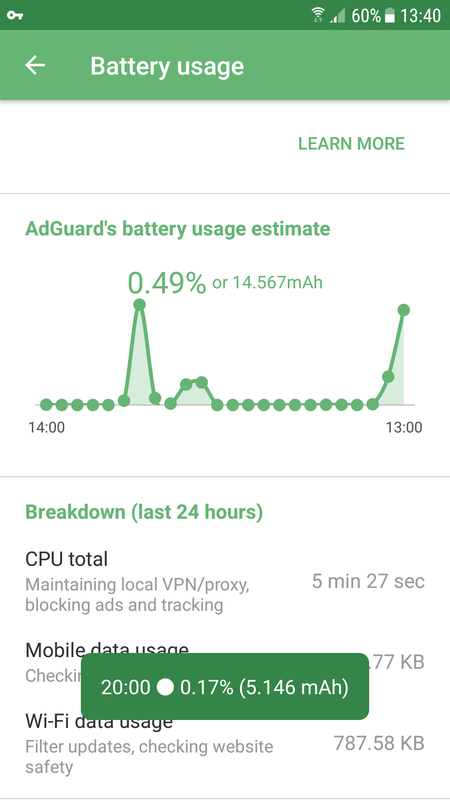 Inside you will find a chart that shows the AdGuard battery resourse consumption within the last 24 hours, with an option to get more detailed hour-to-hour data by tapping on the dots on the chart. Besides that, there’s also a numeric breakdown of the relevant data and a short technical explanation. We have only covered few changes (albeit the most important ones), and the full changelog is truly monstrous this time. Warning you now: don’t look if you have weak heart! Anyway, we hope the new release brings something useful for everyone. And if you expected something else — do not despond and let us know what’s on your mind. Many more releases, many more features to come! We usually try to avoid having “inbetween” major updates, but this time is different. There were not as many big changes to justify labeling this version 2.11, but some of them are still very important so we couldn’t just keep shelving them. A couple of serious bugs have been fixed: misbehaving “Protection” button on Android 7, certificate detection issue and “broken” whitelist. You’ll find a lot of minor fixes too, plus updated translations. For the full changelog, visit our page on GitHub. Today, we are going to tell you about our new policy concerning working with the translators. If you are eager to help and claim some unique rewards along the way, read on!